Signal levels are 5V Single Ended, with HC TTL levels expected. So, each signal uses a single line, and an active high signal will have a High at 3.5V – 5V, and a Low state at 0-1V. The 5V and GND lines are the only supply voltages on the bus. System implementations should make sure these are noise-free, well decoupled, and dimensioned for the system current draw. * Note that IEO/IEI forms an Interrupt Enable Chain, where the IEO of a higher priority card needs to connect to a lower priority card. This means a bus board needs to connect IEO of one “slot” to the IEI of the next. It also means cards need to be present “in order”, or empty slots need IEI/IEO jumpered for interrupts to work. 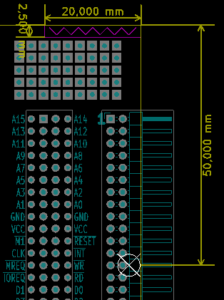 This layout of the signals is relatively simple to layout for both CPU and expansion cards. 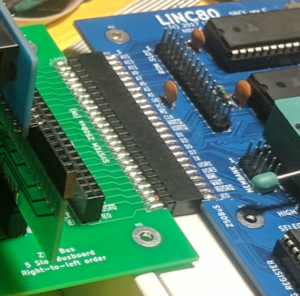 Additionally, it is easily “unfolded” onto a single-row implementation, where using the first 42 pins mapped onto a 1×40 connector gives full compatibility with the bus layout of the RC2014 compatible ecosystem. Pins labelled USR0, USR1, USR2 and USR3 are for the individual user to decide their use. Therefore publicly available Z50Bus cards should not have output signals hard wired to these pins. Having inputs hard wired is acceptable providing they don’t add significant load and can tolerate any 0 to 5 volt signal, but this is not generally recommended. It is recommended that links or jumpers be provided to allow the individual user to determine if a signal is connected to a USR pin. To allow the individual user to access the card’s functionality without connecting to a USR pin, an alternative method should be provided. Typically this would be header pins, or other connector, to allow linking signals to other cards or external devices. If a card or host includes connections to the TX/RX serial signals, links or jumpers should be provided, to allow the individual user decide what serial data source/destination is to have control of these lines. A user may decide to include several serial controllers in their system, but only one such device can have control of the TX/RX signals on pins 37/38. Note that the USR-signals may be assigned defined official alternate signals in the future. Mechanical layout is not strictly bound by the bus layout and design, but to allow for card supports, the following suggestions apply. The standard bus connector to be used, is 50-pin dual-row header pin and socket, with 2.54mm pin pitch. 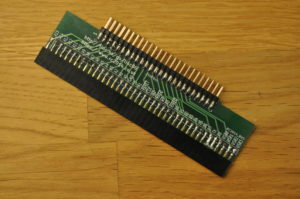 For expansion cards that plug into a busboard, a Male pin header with nominal 6mm pin length should be used (“standard” header, sometimes called 11mm). The bus-side connector should be a Female PCB Header Socket, with nominal 8.5mm height. The recommended nomenclature for the sides of the card makes the edge perpendicular to the edge with the bus connector and closest to Pin 1 (A15 signal) of the bus be the Back edge. The opposite edge is called the Front. The terms top and bottom may refer to either component/pcb tracks, or to physical placement. The PCB Top layer is the component side, Bottom layer being the solder side. In terms of physical placement, the side of the card where the bus connector is located is termed the bottom edge. Mechanically, connectors that will be serving system external functions should be placed on the Back edge. Connectors that will be serving system internal functions (i.e. would not require an external connector on an enclosed system) may be placed at designers discretion. On an expansion card, the center pair of pins (and thus the center of the connector) should be located 50mm from the edge closest to the connector pins 1 & 2 (back edge). Pin 26, the middle pin closest to the bus-side edge of the card, should be located 3.75mm from the card edge (bottom edge). The card should leave space for a support raiser going 2.5mm in from the back edge (closest to pins 1 & 2), extending 20mm along that edge. “Large card” is suggested as a 100x100mm card (Card Size 2). “Standard card” is suggested as a 100mmx75mm card, where the bus connector is on a “long” side (CS1). 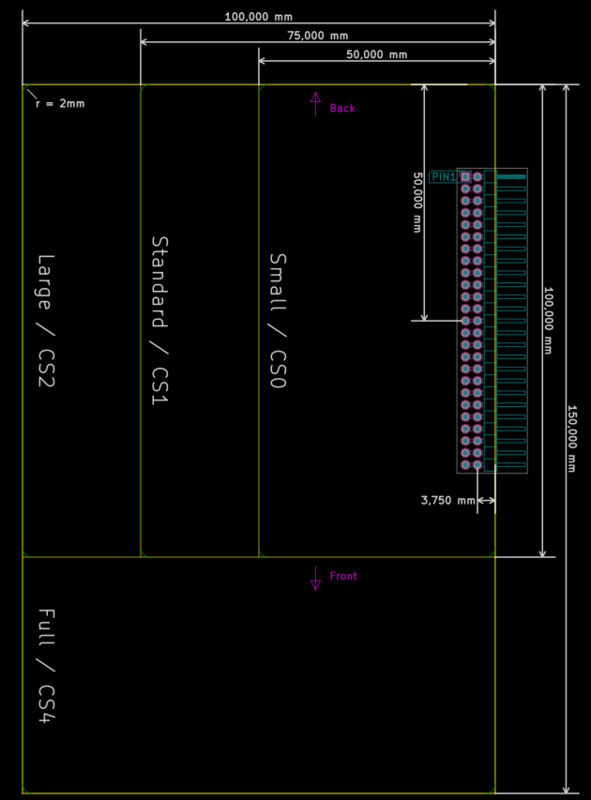 “Small card” is suggested as a 100mmx50mm card, where the bus connector is on a “long” side (CS0). “Large card” is suggested to be 150x100mm, where the bus connector is located on the “long” side, respecting the rule of locating pins 25/26. For connectors used to connect a system board primarily to a bus-board or direct attachment of a single expansion, a suggested arrangement is to use straight connectors placed on-edge, female connector on the system board (main bus) side, and male on the expansion (exp bus) side. This allows the main-bus card and the expansion-bus card to lie in the same plane, without requiring expensive female right-angle 2×25 socket headers. Host/processor boards designed to plug into a bus-board the same way an expansion does, should use a standard right-angle male connector. Being a bus for 8-bit microcomputers designed after 2016, the number of potential CPU’s relevant for new designs is limited. 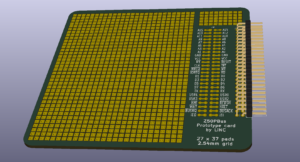 Currently only the Z80-family and the 65×02 family of CPU’s have parts still in production. Because of this, only a 65×02 adaption of the bus is suggested here. Some of the Z80-style signals need to be synthesized. 65×02 uses memory mapped IO, so the IOReq signal needs to be generated by the CPU card/system when a request is made to the 65×02 IO address space selected for the system. The Mreq signal will then be a simple invert of the IOReq signal. An equivalent function of the WAIT and HALT signals may be found on the 65×02 RDY line. A diode split of the function may be appropriate. The SYNC signal can be adapted for the M1 signal function, if the INTAck feature is considered in the implementation. There exists a 65c02 CPU card for the RC2014 system, this should be seen as the reference implementation when adapted to Z50Bus layout for the basic signals. See http://ancientcomputing.blogspot.no/2017/05/a-6502-cpu-for-rc2014-part-1.html. 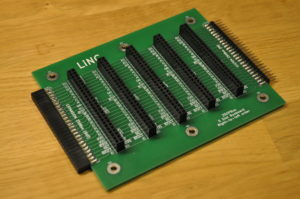 It is suggested that 65×02 based systems using the Z50Bus indicate clearly that not all expansion cards designed for a Z80 native Z50Bus system will be compatible. The products listed under this heading are the products made available by LiNC to support development of Z50Bus based systems. A 5-slot back-plane with pass-through connections is available. The back-plane is designed to accept five expansion cards, and to connect to a host system using a male Z50Bus connection on the right side. The pass-through connector is placed on the left side, allowing for daisy-chaining of multiple back-plane cards. This card is fully passive, so any buffering needs to be done on either the host system, or on the expansion cards. 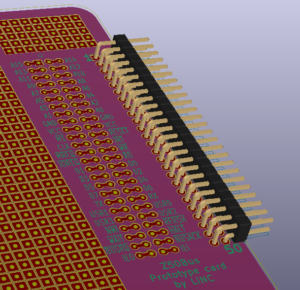 This is a perf-board style prototyping card, with a full Z50Bus connection conveniently brought out on easily available pads. LiNC does not expect to be able to track all Z50Bus devices. 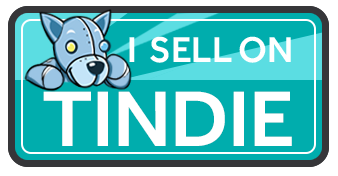 Without including the above mentioned productrs, this list includes devices where LiNC has been involved, either designing, providing information about the implementation, or verified the implementation.